The FUNdation for getting your puppy on the road to being a happy, motivated dog to take you into your choice of the competitive arenas, or just be the best companion that he/she can be. Class will focus on ‘play training’ your new companion, along with teaching basic manners, focus and attention. Clicker training will be introduced, as well as other methods of training. Requirements: Puppies must be at least 10 weeks of age and up to date on shots with at least two parvo shots, the second being administered at least one week prior to the start of class. IF your puppy is not quite old enough at the start of the class, please come yourself and learn what you can do at home! Handlers enjoy a fun learning experience with their dog while learning the basics of agility. This class is intended to acquaint you and your dog with foundation training of handling skills and some low equipment to create a safe and fun sport for you both. Flat skills emphasized include handling (hand-jiving) and stays. Equipment utilized will include tunnels, planks on the ground, bougie board, jumps and low A- Frame and dog-walk. 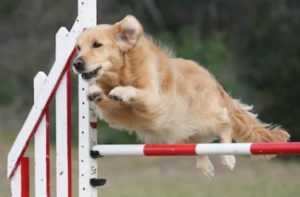 Pre-requisite is successful completion of Agility I or approval to enroll in class after the handler/dog team is evaluated for necessary skills. This class is designed to build on the basic foundation skills learned in Agility I. Dog and handler teams will continue training on lowered contact obstacles. Safe contact performance for entrance and exit will be emphasized utilizing 2o2o (or equivalent targeting behavior) prior to moving the equipment to full height in Agility III. The focus is to continue building the team with an introduction to even more equipment and continued emphasis on working as a team. Weave pole training will begin. Pre-Requisite is successful completion of Agility II or approval to enroll in class after the handler/dog team is evaluated for necessary skills. At this level equipment will be at full height. Short sequences will be run with handlers learning to maneuver front and rear crosses on course, 270 degree turns and obstacle and handler focus. 12 Weave Poles will be taught. Teams can remain in Agility III classes until they plan to compete (or regularly begin running in SMKC Agility Run-Throughs). Pre-requisite is successful completion of Agility III Class or approval to enroll in class after the handler/dog team is evaluated for necessary skills. Additionally teams must be competing at the Novice/Open Standard levels in one of the major agility venues (or are regularly competing in the equivalent level at SMKC Agility Run-Throughs). Dog and Handler teams should be able to perform 14+ obstacle Novice level sequences with few problems. Emphasis will be placed on handling skills so dogs must be able to perform all obstacles without support. Advanced handling skills will be taught that include serpentines and threadles (pull-throughs) in order to prepare teams for Excellent/Masters levels. 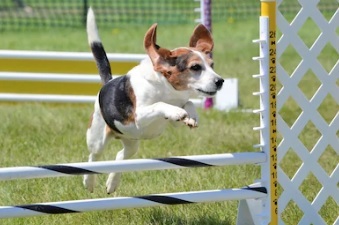 Teams should already be competing in Standard Excellent classes in one of the major agility venues (or the equivalent at SMKC Agility Run-Throughs). Highly complex courses or sequences will be used to test handler skills. This level is designed to develop, enhance, improve and maintain the superior skills that both members of the team need to compete at this level. This level will stress smooth handling skills on a variety of complex/abrupt direction changes, challenges to independent contacts and complicated weave pole entries.